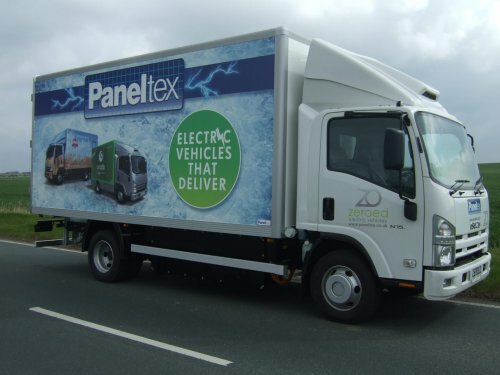 Initially a development project in 2007, the first Paneltex electric trucks hit the roads in the UK in 2008. Since then, there have been successful trials and pilot vehicles in numerous customer fleets. The latest range of the Paneltex Electric Vehicle is based on an Isuzu chassis cab and the GVWR currently offered is 7.5T, with future development projects at higher and lower weight ranges. Highlights include a range of up to 240km, zero tailpipe emissions and pence-per-mile running costs. These vehicles really are an excellent replacement for similar traditionally-powered vehicles. We currently offer three battery pack options, with a capacity of 80, 120 or 160 kWh. We can optimise the chosen battery pack to maximise efficiency, based on the duty cycle of the vehicle in question. This means that, even with an effective payload, we can achieve a working range of up to 240km. At Paneltex, we’re keen to see the uptake of electric vehicles and this is why we offer our electric trucks. All Paneltex Electric Trucks are fully battery-powered and, as a result, they emit zero greenhouse gases at the tailpipe. We want to see environmentally-friendly alternatives to traditional trucks; hence the last decade of development work we have undertaken. In 2007, we started to prepare for the eventual shift to alternatively-fuelled vehicles, by beginning a project to design bodywork and integration for electric trucks. At the time however, there was no viable technology in the 5T – 11T range. So, we built our own pilot vehicle for development. We only wanted a dummy vehicle, but we created such a successful product, that the team decided to build more. We have since spent years refining and improving the concept and the design. Over this time, there have been pilot and demonstration vehicles operating in customer fleets in numerous locations nationwide. At Paneltex, we are not only a manufacturing company. We really try to make the world around us a safer and healthier place. Along with our zero-emission electric trucks, we have worked hard over recent years to put ourselves in a position where we minimize waste and inefficiency. At our head office and main production site, we are pleased that we produce no waste to landfill whatsoever. This has been made possible by our team working on recycling initiatives and resource optimization projects. We believe we are a caring, forward-thinking group of people. We intend to continue with this trend and only work harder to protect our environment and our natural future. To read more about the Paneltex environmental aims, click here.